Military affairs have been affected by major changes in recent years. The bipolar world of two superpowers has gone. The Cold War and the global military confrontation that accompanied it have ended. A new military and political order has emerged in the world, but the world has not become more stable; indeed, wars and armed conflict have become much more common. 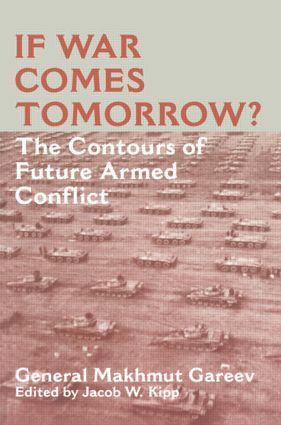 Forecasting the contours of future armed conflict is no easy task at such times, but this is the primary objective of If War Comes Tomorrow? Focusing on the impact of new technologies, General Gareev considers whether war is still a continuation of politics by other means' or whether the political, ideological, and technical transformation have broken that connection. He explores the linkage between threats to Russian national interests and war as an instrument of policy in great detail and concludes that there is very little prospect either of nuclear war or widespread conventional war. However, he does see local armed conflicts and local wars increasing, with greater emphasis on subversion. He argues that coming decades will see a shift towards a reliance upon indirect means to accomplish limited political ends, and analyses both information warfare and the revolution in military affairs from this perspective.